Handsome, virtually indestructable built 20 gauge galvanized steel to prevent rusting. Available in several standard and custom electro-coated colors. Doors are constructed around a 3/8" steel frame with 1/8" round steel bars 1" apart. Doors are removable for ease of cleaning. Doors are electro-coated black. 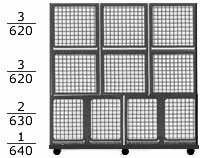 DOES NOT INCLUDE THE DIVIDERS (ED-F630D) FOR THE F630 CAGES. YOU WILL NEED 2 DIVIDERS (sold separately). THE DIVIDERS WILL MAKE THE F630 CAGES 4 CAGES WHEN NEEDED.